Buffalo Township’s wastewater treatment plant is located along Buffalo Creek in Pennsylvania, beneath the State Route 28 bridge. This type of wastewater treatment plant is perfect to serve smaller communities. It supports 6,000 people with 3,100 sewer connections to homes and businesses throughout Sarver, Pennsylvania, and the vicinity. It’s an excellent example of an efficient wastewater infrastructure that uses extended aeration to treat raw sewage, without any initial sedimentation. Raw sewage is collected throughout the plant’s service area and is pumped through two sewage lift stations in the community before it arrives at the plant for treatment. As it is received, any solid material in the waste stream that can be mechanically destroyed (i.e., discarded rags) is shredded by a comminutor pump. The sewage is then piped to two aeration basins. Three large blowers push air through PVC piping and then through bubble air diffusers located at the bottom of the aeration basins. It’s interesting that the only ingredient needed to facilitate this entire treatment process is large quantities of ambient atmospheric air. In many ways, this treatment plant operates like an internal combustion engine, requiring the proper quantities of fuel, air, and a spark to operate. The organic materials (fuel) and the microbes (spark) are already conveniently present in the waste stream. All that is required is air to complete the “combustion," or consumption of organic materials. The waste stream then overflows a weir at the back end of each aeration basin before it reaches the plant’s clarifiers. While wastewater with some suspended solids does flow over the weirs and enters the plant’s clarifiers, heavier organic wastes cannot pass through the weirs and are retained in the aeration basins. Organic solids in the aeration basins are then consumed by microbes that occur naturally in the waste stream. The suspended solids that do pass over the aeration basin weirs are settled and collected in the clarifiers. These solids from the clarifier, concentrated with hungry microorganisms and known as activated sludge, are consolidated and recycled to the aeration basins, to aid in consuming organic matter. Not all the activated sludge that accumulates in the clarifiers is necessary for the proper ratio of food to microorganisms in the aeration basins. Also, some sludge present in the clarifiers may have been in the system too long, losing its biological strength and effectiveness. Excess activated sludge is routinely removed from the bottom of the clarifiers and piped to the plant’s digestion tanks (or digesters). Digesters are similar to aeration basins, except their purpose is to allow the microorganisms in the waste sludge to completely consume any organic materials remaining, then cannibalize themselves and expire. Digesters use larger air bubble diffusers than the aeration basins, but they still rely on the addition of air from the blowers. This process is known as aerobic sludge digestion. The sludge leaving the plant’s digestion tanks is largely inert. Most of the organic matter has been completely consumed by the microbes. The remnants of digested sludge are removed from the digestion tanks, dewatered, placed in dumpsters, and delivered to a local landfill. Water follows a path separate from activated sludge when it leaves the plant’s clarifiers. 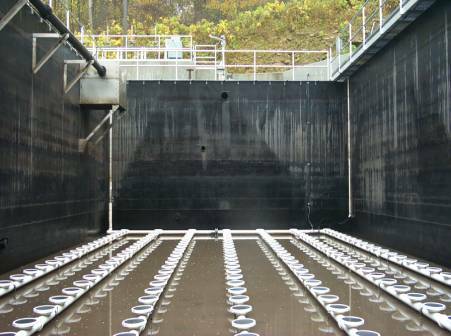 Circular weirs in the plant’s clarifiers allow the clear water portion of the waste stream to be separated. 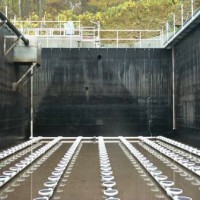 The clarified water portion of the waste stream is then disinfected [by ultraviolet (UV) lamps, in this case] and returned to a natural waterway. While many wastewater treatment plants use chlorine for disinfection, the UV lamps offer an advantage because dechlorination of the final effluent would have then been required here. Discharges from Buffalo Township’s waste treatment plant are received by a high-quality trout stream, Buffalo Creek, that flows adjacent to the plant. The clarified and disinfected liquid wastewater has about a 16-hour cycle time through this treatment plant, while the “mean cell residence time” of the activated sludge in the plant is about 25 days. A final note of importance is that the overall goal of the plant is not to kill and remove all bacteria from the waste stream. Bacteria are already present in Buffalo Creek, as well as in the raw sewage entering the plant. The goal of this treatment plant is to remove Biochemical Oxygen Demand (BOD) from the waste stream -- the quantity of dissolved oxygen that would be depleted from water as microbes digest and chemically stabilize organic wastes. Aquatic life, including fish and plants, cannot survive in oxygen-deprived waterways. Don Amadee, Manager, Municipal Authority of Buffalo Township, Pennsylvania, was a technical contributor to this feature. The aerial photo below of the wastewater treatment plant has been labeled to serve as a reference guide. Follow along as we take a photo tour of Buffalo Township’s wastewater treatment infrastructure. Also, join Buildipedia for a photo tour of Buffalo Township’s water treatment plant, as we trace the flow of water from the Allegheny River to its distribution throughout the utility. The location of the Buffalo Township’s sewage treatment plant is actually at the low point of its entire service area. Gravity flow would normally be sufficient to reach the plant from any service connection. However, two sewage lift stations are used for engineering convenience and community planning -- in one case to route sewage flow away from Little Buffalo Creek. The pumps and equipment located in the lift station require electricity to operate. An emergency generator is located at each lift station in case of power loss. Without electric power to the pumps, the wet wells at the lift stations would overflow with raw sewage. Wet wells are sewage collection points installed adjacent to the lift station buildings. Looking down at raw sewage about 40'-0" below the surface, within a sewage wet well. Within a lift station, these two pumps will draw raw sewage from a wet well orifice directly beneath each and discharge it into piping above. This arrangement is clean and accessible and allows for easier maintenance and repair of the pumps. Here is another view of the pumps in the dry pit. The discharge pipe riser is shown. After leaving the lift station, the raw sewage will continue via gravity flow in pipes toward the treatment plant. A better view of one of the sewage lift station pumps, temporarily removed from its normal housing in the dry pump pit. The sewage pumps are automatically controlled and will operate when set parameters are reached, i.e., when a target depth of sewage contained in the wet well is sensed. Various conditions at the lift station will trigger alarms and also issue automatic phone calls to Municipal Authority employees. The alarm conditions are printed on the face of the instrument. A recording meter shows the volume of sewage pumped from the lift station during a set period of time. Raw sewage first enters the sewage treatment plant through the green pipe shown. Sewage passes through a comminutor pump, briefly accumulates in the concrete tank at this station, and is then piped to the aeration basins. Looking down on the comminutor pump from above. It’s the first device raw sewage meets as it enters the treatment plant. The aeration basins are where most of the biological work in the plant is accomplished. Ambient microbes digest organic materials in the waste stream, reducing its biochemical oxygen demand (BOD). This natural process is greatly enhanced by aeration -- forcing air through PVC pipes with bubble diffusers at the bottom of each tank. A view of the plant’s aeration basins completely drained of contents. 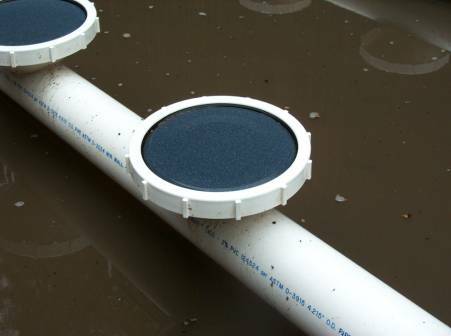 Note the PVC piping and air bubble diffusers that are used to deliver fresh air to the microbes in the sewage normally present within each aeration basin. Photos are courtesy of the Municipal Authority of Buffalo Township. These three air intakes installed on the outside wall of the plant building are used by the blowers, which deliver air to the aeration basins and digesters. Raw sewage enters the aeration basins through the embedded pipe shown at the head each basin, just above the waterline. Along the left side of the basin is the piping that returns the activated sludge from the clarifiers to the aeration basins. 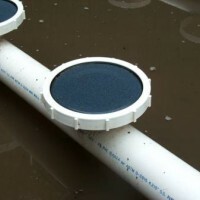 The downstream ends of the aeration basins have weirs installed to keep the heavier suspended organic solids contained within the aeration basins. Water containing a lower amount of suspended solids passes over the weir and into the clarifiers. This shows the discharge end of the pipe that returns activated sludge from each clarifier to each aeration basin. The combination of activated sludge and raw sewage in the aeration basins is known as “mixed liquor." The microbes and organics in this mix are called “mixed liquor suspended solids (MLSS)." The apparatus is designed to allow water to flow across the clarifier weir and to allow for the collection and settlement of solids within the clarifier. Water leaving the clarifiers passes across this weir and is sent to the disinfection station. A view across the top of both the plant’s clarifiers. The plant uses an alternative to chlorine disinfection. Concentrated UV radiation has a fatal effect on microbes. Their DNA absorbs and is destroyed by the UV radiation. A view of the UV lamp array at the disinfection station. The sludge digesters look similar to the aeration basins. Compared to the aeration basins, note the larger footprint of the bubbles in this tank, caused by the larger diameter air diffusers beneath. Food is scarce in the digesters, and the microbes consume that and then each other until only a trace amount of organic matter remains in the sludge. A look at the two types of bubble diffusers used in the plant. The circular ceramic diffuser is used in the aeration basins and produces thousands of fine bubbles with a huge aggregate surface area. The larger metal diffuser (coarse bubble diffuser) is used in the digesters and produces larger bubbles with less aggregate surface area (but is less prone to clogging in the higher density sludge). Movement of the sludge from the digesters to sludge dewatering equipment is controlled in this valve pit. Following aerobic digestion, the waste sludge is pumped to this dewatering equipment (belt filter press). Sludge is placed at the top of the machine and then run through a belt press apparatus to mechanically dewater it. The sludge cakes that result are carried by the conveyor belt to a dumpster outside the building. A chemical additive is added to the waste sludge during the dewatering process to improve its ability to coagulate and bond together in cakes prior to final disposal. The dewatered sludge that is ready for disposal is transported by a conveyor belt through an opening in the plant building’s wall and deposited in a dumpster. The sludge cakes are then deposited in a landfill. Since electric power is crucial to the plant’s operations and raw sewage overflows would occur without it, an emergency generator is an important feature of plant operations. These blowers are the source of air for the diffusers in the aeration basin and digesters. A testament to the quality of the equipment and an interesting field test: A nickel rests on edge next to an operating blower’s vibration sensor. Vibrations out of tolerance will be immediately obvious if the nickel drops from standing on its edge. Control station for operation of the blowers. A look at the lab work station in the treatment plant building. Since biochemical oxygen demand (BOD) reduction is the key goal of the plant, waste samples are routinely nurtured for 5 days and then evaluated for BOD as part of the plant’s testing procedures. As part of the normal testing procedures at the plant, sludge samples are dried out and evaluated for total percent solids.